But wait, your pet needs to stretch those legs! During the winter months you and your companion’s physical activity levels may tend to drop off. It’s cold out, it gets dark early, and the weather is often miserable. So, what to do when you can’t get outside and get ourselves and our pet exercise during winter? There are plenty of fun and safe indoor activities for your dogs and cats in the winter. 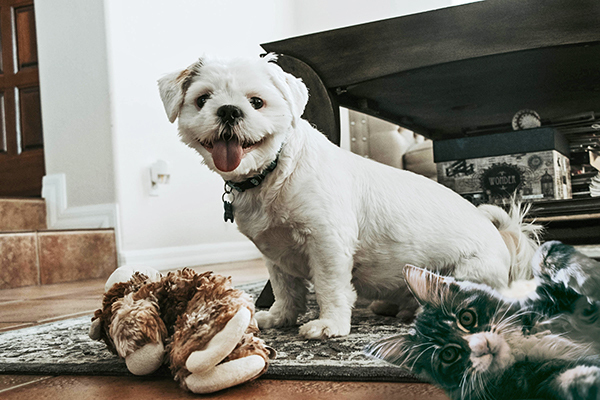 Keeping your feline active in the winter can be easier than keeping your dog active due to their size and the availability of indoor products. Cat trees for climbing and chasing mice and feathers on a string are great exercise. Cats are natural hunters, so try playing a hunting game with them by hiding food or toys around the house and letting them hunt them down. For our K9 companions, however, we might need to be a little more creative with our indoor activities. Going outside in the winter can pose threats to our dogs and cats through extreme temperatures, and even by the salt used to keep our streets and sidewalks ice-free. If ingested salt can cause serious issues for dogs, and even walking has been known to eat away at our pets’ paws. So, when going outdoors with our dogs just isn’t a possibility try some of these fun things to keep them active. Remember to always play safe, and some indoor spaces may not be large enough for some of these fun activities. Include your children when you can too, as this can be great fun and exercise for the whole family. It may be helpful to keep a daily or weekly schedule for this activity, and it may even help you stay on top of any new year’s resolutions! However, when it is possible to get outside on one of those rare, nice winter days remember a few things to keep your pet comfortable and safe. It is still winter, and the weather is colder than normal. For some smaller animals, and short haired breeds you might still need to make sure they stay warm with a coat or sweater. They may look goofy, or as cute as ever, but this will keep your pet safe. Also, the perfect time for a photo-op! The same goes for their sensitive paws. Pet boots will help protect their paws from the frozen ground and from the road salt that can damage their skin. If you don’t have boots for your pet, then be sure to wipe their paws with a damp cloth after being outside to clean away any salt. For more tips and suggestions to keep your pet active and healthy this winter, or if you have other concerns regarding your pet’s health, please don’t hesitate to contact Delavan Lakes Vet Clinic online or give us a call at 262.728.8622.